In the current environment, public school districts can struggle to keep dollars from leaving the district, as funding often follows students to online and charter educational opportunities. Every dollar that a district can retain means a new book for students, a new teacher, a new uniform for an athlete, and more. To address this issue, Florida's Polk County School District partnered with FuelEd, creating a portal that helps Polk retain those funds in the district. The new enrollment portal not only makes it easy for students to self-enroll in quality online courses and for counselors to approve or deny their requests, it can also save Polk County more than 60 percent over their previous provider by keeping the enrollments within the district. In Florida, the Department of Education requires that every high school student complete an online course in order to graduate.i This is a fantastic idea, as exposing primary and secondary school students to online learning can expand learning opportunities and provide students with crucial life experience. By gaining online learning experiences early, students are better prepared for college and careers where online learning is commonplace today. The downside is, Florida districts frequently see funds diverted when students enroll in virtual courses delivered by a provider outside of their district. Local district funds are redirected to the provider for each course a student takes. This can result in tens of thousands of dollars for an individual school or district, going to outside online education operators. Over the past several years, Polk County has partnered with FuelEd to provide quality online content to Polk students, and they recently turned to us to help create a Polk-managed portal that could help keep more funds in the district. 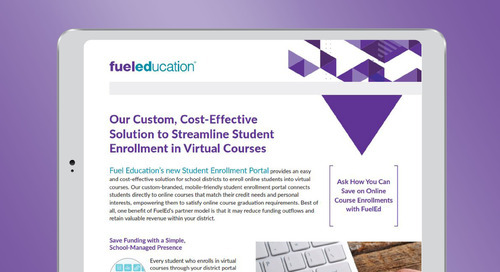 Polk and FuelEd worked together to design a custom portal that streamlined the student enrollment process for the district. The district-branded, student enrollment portal for FuelEd courses is now one of the options available to Polk County’s middle school and high school students for online courses. Students simply select their school, select a course, “sign-in” or “sign-up” for PEAK, and then submit their request. The three step process is quick and easy for students. The portal was designed to be mobile friendly so students can even enroll on their phone! It’s also easy for the guidance counselors to review and act on requests. All they have to do is log in to the approver space with their existing credentials, select the student enrollment requests, and then select approve or deny. They have the option to approve or deny individually or in bulk. As a member of the FuelEd product development team, I was brought in to scope out the portal requirements, and work with Polk’s virtual school leadership and our internal teams to build and promote the portal. We designed a fluid user experience, created flyers and posters for the school, and developed training materials to assist the guidance team’s transition. I’m extremely happy that the FuelEd teams across client services, design, and engineering were able to work so well together, finding a truly elegant solution for Polk. I can’t say enough about the leadership at Polk who put their faith in FuelEd to solve a major challenge. Looking forward, I see this student enrollment portal model as a way for public school districts around Florida (and beyond) to save precious dollars. Dollars that will help a great many students expand their goals and be better prepared for the future. 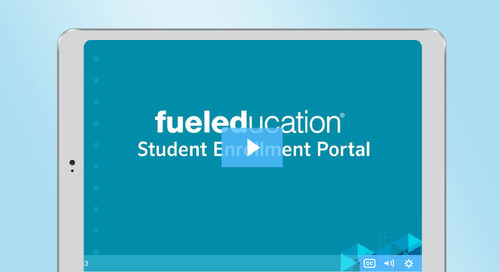 To learn more about how a personalized student enrollment portal can help keep dollars in your district, click here.